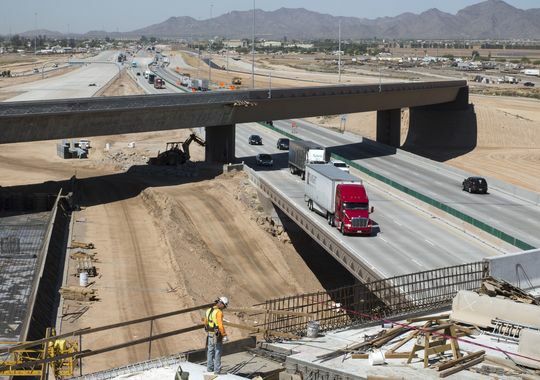 The 0.5% sales tax that funds transportation projects in Maricopa county since 1985 is on track to come up a few billion dollars short by the time it expires in 2025. The funds are used to pay for all manner of projects including local street improvements, bus pullouts (to make car travel faster), transit including bus and light rail; by most of all and by far the most dollars are spent building highways. From a sales tax. There are those who fancy that motorists are “paying their own way”, through from example fuel taxes and VLT (vehicle license tax) but that’s just not so. These funds have been shrinking for a variety of reasons not the least of which is the major component, fuel tax, has not increased in over over twenty years. Az Republic story Liability for government-issued vehicles on the rise Stated some of the obvious; bigger, sprawly cities tend to have more driving by public-sector workers, invariably leading to more liability costs to cities/taxpayers. Just another socialized cost of sprawl and automobility. The sidebar has some interesting dollar figures for a number of Phoenix-metro area cities (and Maricopa county), all were costs paid out by the municipality over the period from ~ 2008 through 20012. A small, compact city like Tempe clocks in at $806K, Scottsdale is up at $2M. Scottsdale at a population of ~ 221K people is somewhat larger than Tempe’s 164K; but certainly not nearly triple! But Scottsdale’s land area at 186 sq.mi. is way larger than landlocked, mostly built-out Tempe’s 40 sq.miles. Phoenix is of course the 500 pound gorilla: $23M paid out, with 1.5M people, and a whopping 517 sq. miles of land area. The AAA puts out a report on the costs of operating a car each year, and are always fun… figure a ballpark of 60 cents a mile. It’s been my experience that car owners are in consistent denial, other than chronic moaning about the price of fuel, about the high costs of automobility. (and fuel ends up being only about 1/4th of the overall cost). And these costs only represent direct costs; socialized costs (pollution, policing, mayhem, free and subsidized parking, various non-fuel taxes, etc) are not even attempted to be measured here. An op-ed written by one of the wsj editorial board staffers illustrates a certain strain of belief in have-your-cake-and-eat-too-sism. Kaminski, in decrying how the mayor Mike McGinn (whom he gleefully points out is referred to as mayor McSchwinn by his political foes. Get it? it rhymes with McGinn) of Seattle worked to block the building of some car-based project; later claims that “Seattleites say they want to save the planet from global warming, but in their personal lives they want safe streets…”. The disconnect Kaminski, and others of his ideological ilk, is this; that somehow streets can be made safer by ever-expanding the number and speed of privately operated motor vehicles. But this is simply not possible. Faster and more always equals more dead; mostly more motorists, but also more dead peds, and more dead bicyclists. The numbers are stark; comparing e.g. Phoenix with Seattle (metro areas), the Dangerous by Design survey estimates Phoenix to be FOUR TIMES more deadly to pedestrians than Seattle. The number spills over not just in pedestrian deaths, but also cyclists deaths, and also to MOTORISTS deaths; see e.g. Beyond Safety in Numbers: why bike friendly cities are safer (for everybody). Thus Kaminski rejects car-user-fees as hair-brained; yet motorists are the source of enormous externalities — economic impacts that aren’t paid for by their users — from air pollution (never mind ‘global warming’), to mayhem, to free parking. By the way, McGinn has only been mayor for the past two years; I’m not suggesting that McGinn has made it safer. It was already safe, relatively speaking — due in no small part to its general overall “anti-car” culture. Seattle DOT (SDOT) puts out a fancy traffic safety report (every year, i imagine), e.g. here is 2011. Note the “speed studies”, p 7-7… their major streets are posted speed limits of mostly 35, with a few at 30, and one at 45. The 85th percentile speeds were running in the high 30’s. What? a sales tax to build freeways? Why yes, it’s true — sales, and other general funds are often used to build roads and freeways. Though this particular tax (the prop 400 one-half percent general sales tax) supposedly goes to pay for all sorts of transportation projects — including light rail, local street improvements, buses, roads and freeways — the largest amount goes to build or expand limited-access freeways. These freeways in particular aren’t even open to bicyclists; but, along with everybody else, must pay the sales tax. Oh, and it’s not as though bicyclists are left out; bicycle and pedestrian improvements combined get 2% of the funds. What about fuel and other specific use taxes (like the VLT… for more, see Road Taxes)? They’re simply not enough. Automobility does not generate enough tax revenue to sustain itself, thus these subsidies to drivers paid from general funds. Not to mention any of the litany of externalities caused by driving — free parking, pollution, mayhem, etc. Some Valley freeway projects will be delayed up to five years by a sharp downturn in revenues prompted in part by the recession, regional transportation officials say. Proposition 400, approved by Maricopa County voters in 2004, imposed a countywide half-cent sales tax for 20 years to fund regional transit projects – freeways, streets, buses and light rail. Q: What does Proposition 400 do? A: It would extend for another 20 years a half-cent transportation sales tax in Maricopa County that was first approved in 1985 to fund freeway construction. Without voter approval for an extension, the tax expires at the end of 2005. Q: How much would be spent on each type of transportation in the MAG plan? A: Of the $15.8 billion dedicated to program funding, $9 billion, or 57 percent, would fund freeways; $2.7 billion, or 17 percent, would fund the regional bus system; $2.3 billion, or 15 percent, would fund light-rail expansion; and $1.5 billion, or 9 percent, would fund arterial streets. The remaining 2 percent would fund air-quality programs, bike and pedestrian routes and planning activities. Apparently there is a mandated audit to be performed every five years by the AZ Auditor General, here is the detailed report. The AZ Republic did a news story timed with its release, though it didn’t say much. The detailed report has some pie charts that don’t exactly match up with the Q&A; for example it shows, in percentages exactly 3 components: Freeways 56.2, Transit 33.3, and Arterials 10.5% One guesses that the 2 percent catch-all (which includes bike and ped planning) is snuck in somewhere. The report gives no details on the ancillary activities. Oh, and I learned a new acronym: RARF, the Regional Area Road Fund is where the prop 400 sales tax monies go. (the HURF, Highway User Revenue Fund, is where motor fuel taxes and vlt goes). The light rail came off pretty well; noting the thing was built on schedule and just slightly under-budget. Peer-city comparisons were generally favorable. Superhuman-sized objects moving at superhuman speeds are dangerous. Inherently. But who bears this danger? Motorist liability insurance is one supposed motivator; in theory motorists are supposed to bear the cost of the risks they are inflicting on others, but has many limitations (see e.g. The Disneyland Model). In reality this risk-spreading ends up socializing the costs of driving — paid for by others, subsidized, also called an externality. Thus we get more driving, because it is artificially cheap, and more traffic death and destruction. It is worth pointing out to nervous cyclists that the large majority of traffic death and destruction is done by drivers of automobiles to other motorists (see, e.g. the chart here). This is to be expected, of course, since the large majority of traffic is motoring. Girl critically injured, was standing on the sidewalk, May 6, 2011: Deette Lynn Perry, 54, was arrested Friday after she was discharged from the hospital, where she had been admitted following the May 6 incident, Sgt. Steve Martos of the Phoenix Police Department said. Perry was in a 2004 Nissan Altima near Thomas Road and 23rd Avenue when she drove onto the sidewalk and struck a 17-year-old girl, Martos said. Police suspect Perry was impaired by drugs, Martos said. The girl suffered a fractured pelvis and severe head injuries, Martos said.